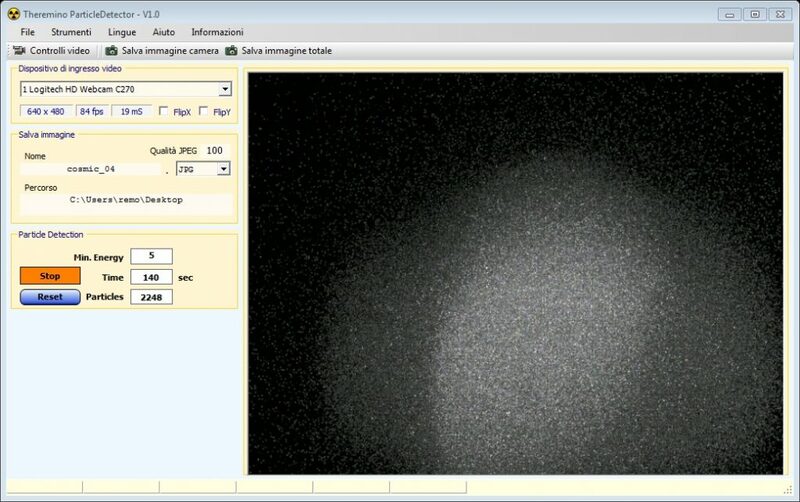 In this post we propose to use the Webcam ParticleDetector as a digital sensor to perform simple educational and demonstrative X-rays. The use of a webcam as a particle and radiation detector has been described in these articles : DIY Webcam Particle Detector, Webcam Particle Detector Measurements. The webcam, appropriately modified and used with a suitable software that integrates the images acquired by the CMOS sensor, has proved particularly suitable for the detection of charged particles such as electrons (β radiation). Inside the webcam is present the CMOS sensor that is the light-sensitive element. The CMOS sensor is in practice constituted by a matrix of pixels. Each pixel includes a photodiode and a conversion circuit / amplifier that converts the charge originated in the photodiode into a voltage that is read, pixel by pixel, and subsequently digitized into a numerical value ranging from 0 to 255. To select the color a tiny color filter (red, green and blue) is positioned above each pixel, resulting in a “mosaic” of colored pixels, then the image is processed in a timely manner (interpolation) to reconstruct the original image. 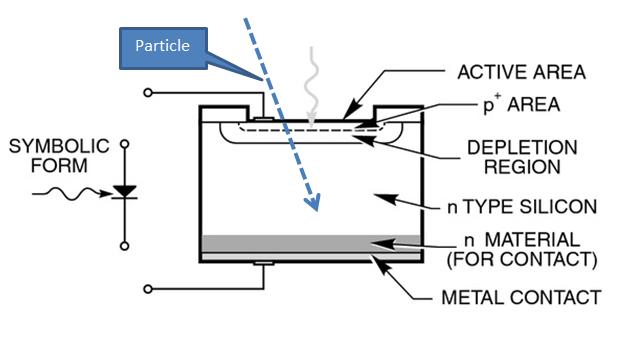 The active element, sensitive to particles, is the photodiode, shown schematically in the image below. The ionizing particle enters into the sensitive area from the “top window” and produces in its passage several hundred electron / hole pairs which are collected by the cathode / anode of the diode and produce the signal that is subsequently digitized. 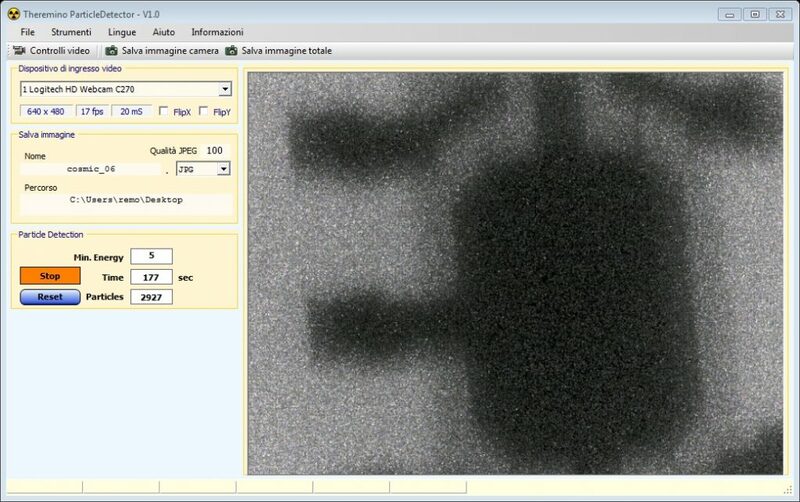 As you can see from the data shown above, an electron which runs 10 μm produces about 1000 charge carriers, and thus an easily detectable signal, also because the electronic detection is local on the chip. In addition to charged particles such as electrons, the CMOS sensor is sensitive, albeit to a lesser extent, even to electromagnetic radiation ionizing as γ rays and, above all, X-rays. Actually the CMOS sensor is not optimized for the detection of radiation and therefore the detection efficiency is very low. 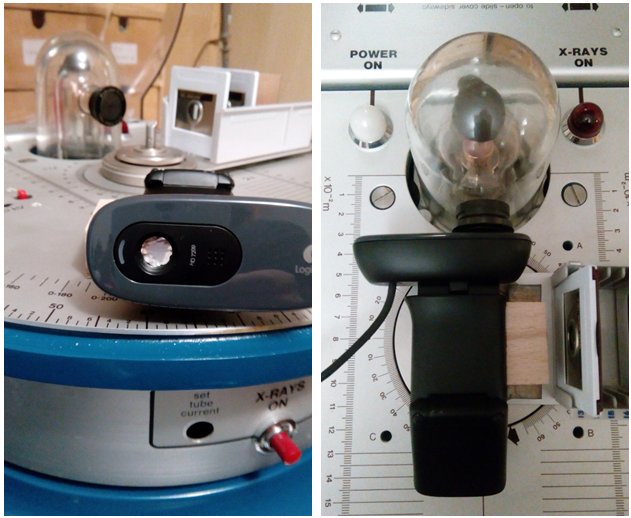 In the images presented below you can see the modified webcam, together with the X-ray tube of the Teltron diffractometer, used for these “digital” radiography tests. The images below show some digital radiographs obtained with the webcam-based sensor. The first two are the images obtained with the 1 mm slit collimator and with the 1 mm hole collimator: in practice it is the image of the X radiation beam coming out of the collimators. The images are quite satisfactory, they show the central part, the clearest one, which corresponds to the collimated beam and an external part, gray, which corresponds to the X radiations with greater angular divergence. 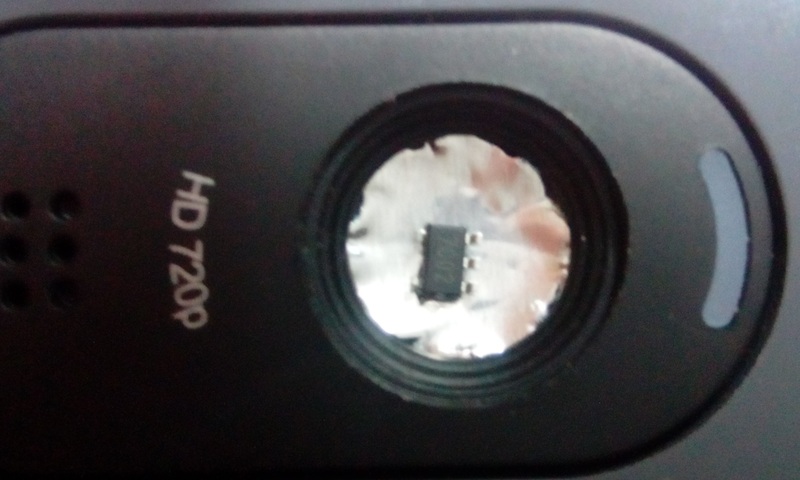 Using the Webcam and the ParticleDetector application we tried to make the “X-ray” of an SMD electronic component, the image below shows the SMD component placed on the lens of the webcam, a lens screened by light with an aluminum foil. 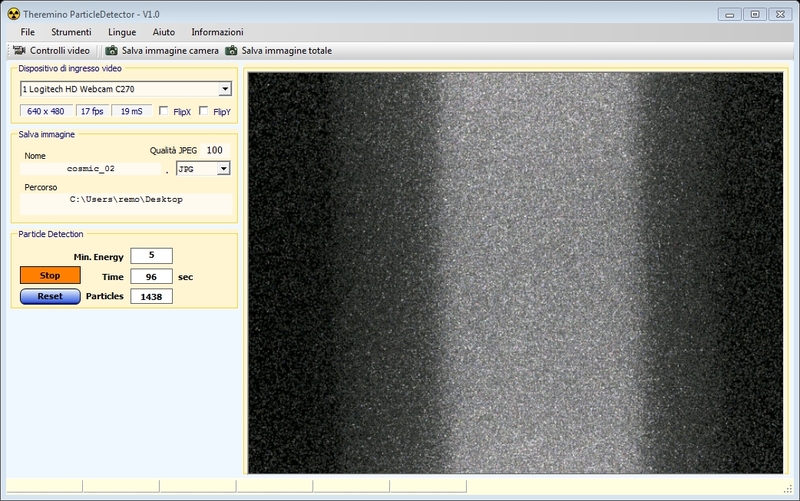 The image below shows the result obtained, in which you can see the dark areas that correspond to the metal parts or to the higher density parts of the component. Naturally, the result obtained has many limitations: first of all, the small size of the CMOS sensor of the webcam, with a side of few millimeters only, it allows only the smallest objects to be examined. The aluminum shielding also influences the resolution of the image because it causes a certain scattering of the X radiation. 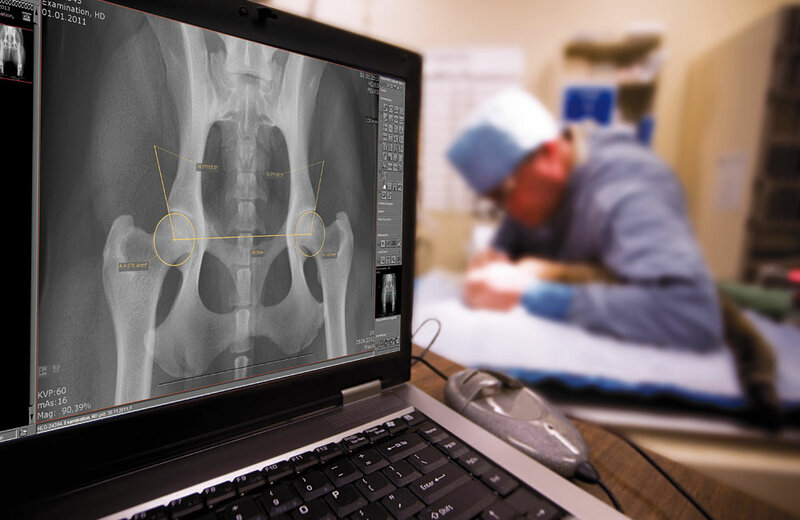 Despite these obvious limitations it is however interesting to notice how a common webcam can be a valid tool for making educational radiographs of small objects.